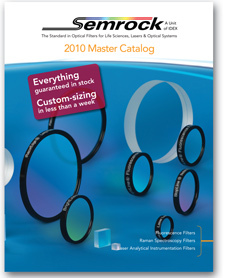 Rochester, NY - Semrock announced the release of its new 82-page, full-color 2010 Master catalog of optical filters and related products. This comprehensive catalog contains 28 Technical and Product Notes, new White Paper Abstracts along with a brand-new product family and 50 new filters products optimized for fluorescence, Raman spectroscopy and other laser analytical instrumentation applications. The product family highlighted in this catalog enters new territory with and entirely new class of thin-film filters - VersaChrome™ tunable bandpass filters. VersaChrome filters offer wavelength tunability over a very wide range of wavelengths by adjusting the angle of incidence with essentially no change in spectral performance. With a tuning range of greater than 12% of the normal-incidence wavelength only five filters are needed to cover the full visible spectrum. They are ideal for applications ranging from fluorescence imaging and measurements to hyperspectral imaging and high-throughput spectroscopy. With their excellent polarization insensitivity and high optical quality and damage threshold, they are well-suited for a wide range of laser applications as well. The new catalog also features many additional products to Semrock's extensive selection of "no burn-out" BrightLine® fluorescence filters and sets, including new multiband filter sets, fluorescence filters, and dozens of bandpass filters and dichroic beamsplitters. Exceptional Semrock services highlighted in the catalog include Semrock's guaranteed same-day shipping policy, rapid custom-sizing in under a week, and a 30-day no-hassle return policy. And all Semrock filters are covered under the company's five-year warranty. Semrock, Inc., a Unit of IDEX Corporation, manufactures optical filters that set the standard in performance and reliability for the biotech and analytical instrumentation industries, as well as innovative optical filters for more general laser and optical systems applications. All Semrock optical filters are made with hard ion-beam-sputtered optical coatings. OEM filters are manufactured in volume. End-users benefit from a wide selection of standard catalog products that ship from stock. Semrock's patented and patent-pending products include its highly acclaimed BrightLine® fluorescence filters, state-of-the-art filters for Raman spectroscopy, and other unique filters for lasers and optical systems. Semrock's innovative products, made possible by combining modern ion-beam sputtering with Semrock's proprietary volume manufacturing technology, are covered under a five-year warranty. Founded in September 2000, Semrock is based in Rochester, New York, a well-known center of optics, and has sales offices throughout the United States. In October 2008 Semrock became a Unit of IDEX Corporation. For additional information about Semrock, its products, and its team of international distributors, visit the company website at www.semrock.com.